In the debate leading up to the passing of the new bankruptcy bill that became law early in 2005 and which made it more difficult to be cleared of debts when filing for bankruptcy, two broad positions were argued by proponents and opponents of the bill. Proponents maintained that many debtors were opting for bankruptcy out of irresponsibility and laziness. That is, they had the means to pay at least some of their debts but chose bankuptcy as an easy way of escape from their obligations. Their debts, it was implied, were the result of carelessness and overspending. Opponents, on the other hand, cited statistics which showed that the vast majority of debtors were driven into bankruptcy because of illness, divorce, loss of job, or some other event beyond their control. Individuals and families who otherwise could regularly make payments on their debt were pushed over the limit by some unexpected calamity. Although I was opposed to the new law and consider it one-sided in favor of banks and credit card companies, nevertheless it must be said that the arguments of most of the opponents of the bill did neglect to take into account one important fact. This is, that part of the reason why for many people an illness or a job loss or even a natural disaster was just enough to push them over the limit was that they were spending too much - too much on their houses, their cars, their clothes, and on the numerous gadgets that Americans have come to feel they have a right to. Now before anyone accuses me of favoring the rich banks over the poor or middle class, let me say, as will become clear below, that the persons I hold ultimately responsible for this state of affairs are the very bankers, advertisers and others who encourage us in our overspending. But still it is not wrong to point out that the image of a poor debtor in his small house and old car is not always correct. Sometimes it is the individual or family in a large house, with an interest-only mortgage, in an SUV, with the latest cell phone, large screen TV, stylish clothes, etc. 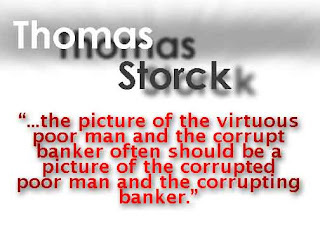 For what has happened in the United States, and to one degree or another throughout much of the world, is that capitalism has corrupted the poor themselves, has corrupted us all, so that the picture of the virtuous poor man and the corrupt banker often should be a picture of the corrupted poor man and the corrupting banker. Now before I go further, let me digress and discuss what I mean by capitalism. When I condemn capitalism, I am not advocating socialism or state ownership. Rather, when I speak of capitalism, I use the term as Pope Pius XI did in his great 1931 encyclical Quadragesimo Anno, namely, as the separation of ownership and work. That is, under capitalism most of us do not own the means of production but we work as hired hands for those who do. And those who do own the means of production are usually removed from the actual productive work of the firm, either entirely, as are shareholders, or partially, as are owner/managers. Because of this separation of ownership and work there is a strong temptation for those who are the legal owners of the means of production to focus not on creating the goods or services which we humans need, but to look for any way to make a buck. Thus mergers and buyouts, stock deals, currency manipulation, and similar activities tend to replace real production as the chief preoccupation of the economy, even though these usually do not result in the creation of any real goods or services. The separation of ownership from work tends to turn the economy away from attention to real human needs to the notion of making money by any means which are legal - and frequently not even that. If a merger or stock manipulation will make more money for the managers or stockholders of a company than steady production of a reliable product, then there is every temptation to forget about production and devote oneself to the more lucrative task of fictitious economy activities, such as mergers and buyouts, which frequently result in job losses and even a reduction in the manufacture of real goods. If we ask ourselves, however, why man needs an economy, the answer surely is because we need real goods and services in order to live. The economy exists so that we can supply each other's needs for legitimate goods and services and in the process earn our own living. It does not exist so that some can get rich no matter what harm they inflict on the common good by manipulation of surrogates for real wealth, such as stock certificates or currency. We see the effects of the separation of ownership and work most perfectly in the corporation. The real owners of a corporation are, of course, the stockholders. But how many of these care about the actual product of their company? As long as the dividends keep coming or the stock price keeps rising, most of them are not concerned with how the company is actually run, with the quality of its product, its labor policies, or anything else that one might suppose should concern the actual owners of a firm. It might be argued that unless a firm produces something of value it will not be able to stay in business long, and thus the threat of ultimate bankruptcy will keep the managers focused on the task of production. But this is not the case. For in the short run, managers and directors can often find easier and more lucrative ways to make money, as I said above. If a company is run into the ground, but its directors bail out with large pensions and "golden parachutes," the company's bankruptcy is hardly a concern of theirs. An economy that looks to the real purpose of economic activity, the supplying of our external needs so that we can devote ourselves to what is more important, to the things of God, to our families, to cultural and intellectual activity - such an economy will always tend to preserve the correct order among the variety of our earthly tasks and needs. But one in which moneymaking becomes an end in itself will corrupt every one of mankind's pursuits, not excluding the Church of God herself. But to return to my argument, the shift from an economy focused on production for man's needs to an economy focused on any method for making money, has resulted in a commercialized culture in which money and goods have become the preoccupation of many people's lives. Hardly anyone is exempt from this, and the fact that one does not have enough money to participate in the economy of greed does not deter many. Indeed, credit card companies and advertisers would be aghast if it did. For if people began saving and only bought what they truly needed, our economy would collapse. Over two-thirds of U.S. Gross Domestic Product consists of consumer spending. We are dependent on people always wanting the newer or the "better" or the bigger. We even see nothing wrong in this and think it is a natural way for man to live. We do not think, How large a house do I need for my family, but rather, How large a house can I afford the mortgage payments for? In fact, as average family size has fallen in the United States, average house size has increased. But do developers and builders build with an eye for what families need or do they build the biggest they think they can sell? I am sure that many will reply that no one is forced to buy McMansions or SUVs. Exactly. It is advertising, building on the fertile soil of our commercialized culture of greed, which in turn rests upon a human nature wounded by original sin, that facilitates this. If advertising vanished tomorrow, we would still buy food and clothes and shoes, things we really need, but perhaps we would gradually stop buying all the other things we don't need. But advertising and our commercial culture have taught most of us to buy and spend without regard to our real needs, so that now any financial setback threatens our ability to meet our ordinary expenses. Thus bankruptcy. Now is there anything here which should be of concern to Catholics, and indeed all Christians? If we take seriously the doctrines of our faith, we should note that in general Holy Scripture and Christian tradition are quite suspicious toward the economic motive in human affairs. Who can forget the words of St. Paul, "if we have food and clothing, with these we shall be content. But those who desire to be rich fall in temptation, into a snare, into many senseless and hurtful desires that plunge men into ruin and destruction. For the love of money is the root of all evils; it is through this craving that some have wandered away from the faith and pierced their hearts with many pangs" (I Tim. 6:8-10)? Can anyone seriously contend that Paul looked upon a limitless desire for increased material comfort as a good thing? Every Christian knows that our powerful sexual appetite must be kept in bounds by social custom and even law, but what of the nearly equally powerful appetite of greed? In view of the essentially negative attitude which Holy Scripture and Christian tradition take toward an unnecessary preoccupation with material things, are we not justified in thinking that the same sorts of social custom and law must be used to keep this latter appetite in check too? But because nearly all discussion in our society is automatically classified according to our bitter, confusing and demonically-inspired division into Right/Left, Conservative/Liberal, many otherwise faithful Christians think that such criticism of moneymaking smacks of all the errors and evils of the Left. All too many people discount or refuse to listen to anything which they think savors of the other side, whom they identify as the enemy, almost the Devil himself. But whether one is deluded into embracing the ideology of the Left or the Right, the words of St. Paul still stand and still have to be taken into account. We cannot dismiss him. A Christian who identifies himself primarily as a follower of Jesus Christ will look for truth in the genuine sources of revelation, not amidst the partisan verbiage that passes for discussion in our day. I do not expect any real reform of our hedonistic and chaotic American society. But I would like to see a little attention by Catholics and other Christians to this subject, a little recognition that our fascination with riches and goods is not pleasing to God. It is true that the clergy largely ignore it, indeed, many of them are avid participants in it. But none of that negates the teaching of the Gospel. We ignore it at our peril, indeed at the peril of the moral and even physical health of our nation. And especially at the peril of our souls. For it is "easier for a camel to go through the eye of a needle than for a rich man to enter the kingdom of God" (Matthew 19:24). Originally published on Traditional Catholic Reflections and Reports, May 2006.